The rapper flexes his comedic muscle in a new video segment. Vince Staples is a national treasure, not only for his prowess as a rapper but also for the wit, insight, and humor that he provides on a consistent basis through his Twitter account and other appearances. In a new video segment for GQ, Vince breaks down some of the men's magazine's past Men of the Year selections, including Kobe Bryant circa 2001 and Tom Cruise in an Abercrombie and Fitch polo. It's hilarious, but you already knew that. 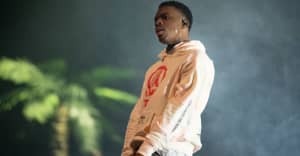 Revisit Vince Staples' conversation with Mac Miller on rap and race.